Show off your creative style! 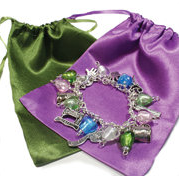 This handmade silver color bangle bracelet has a flourish of glass beads and sewing and fiber arts-related charms along its 9" length. Lobster clasp. Each bracelet is wrapped in recycled pattern paper in a colorful silk drawstring pouch.